In shinkansen trains, there are usually payphones, restrooms and vending machines. A mobile cafeteria that sells bento boxes, drinks, snacks, specialties of the departure city is also available. 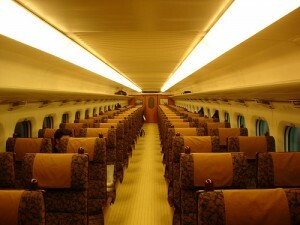 Most shinkansen offer a choice of Ordinary Cars (coach) and Green Cars (first class). 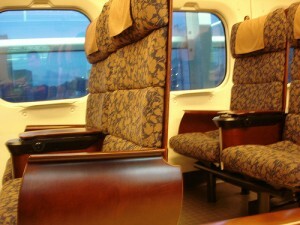 In ordinary cars, there are coach class reserved and non-reserved seating. It’s very clean in the cars, and the seats are comfortable but green cars definitely offer greater comfort. They have larger seats, more legroom and more luggage space than ordinary cars. – Hot towel and beverage service. – Special radio programs for shinkansen and NHK Radio 1. – Outlets on every seat. – “Synchronized Comfort Seat” that tilts as it reclines. – Leg warmer (warm air comes out by pushing button on the seat). Recent shinkansen are designed to give more calm and relaxed feeling by using woods instead of plastic materials. The Kyushu Shinkansen Tsubame 800 series has Japanese taste in the interior; the blinds are wooden roll-up, the seats’ covers are Japanese textiles, and the smooth wood seats remind legless chairs. Will Karaage Chicken Craze Go Global?